Steven Lee Myers is a columnist for the New York Times and the author of The New Tsar: The Rise and Reign of Vladimir Putin. Myers talks about the life and career of Vladimir Putin from his time as a KGB foreign intelligence officer to his current role as Russian president. The interview covers a wide range of Russian history from World War II to the current conflict in Ukraine. Check out the interview below and the “Welcome to Putinland” series on the blog. I have also included multiple articles and links for further reading below the show notes. What is a Tsar? 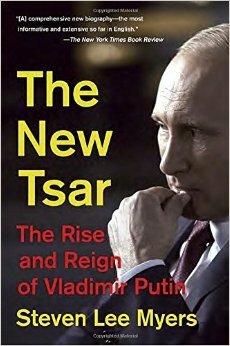 Myers explains the historical role of a Tsar in Russia. Vladimir Putin’s upbringing in Leningrad what is called Saint Petersburg today. His early childhood in the Soviet Union. Putin grows up with the legacy of the “Great Patriotic War,” and is exposed to tales of “heroism and suffering.” As he prepares for a career in the KGB, Myers explains that Putin comes of age in the “high water mark” of the Soviet era. Inspired by a movie called The Shield and the Sword, Putin decides to join the KGB. Putin joins the foreign intelligence branch of the KGB in 1975 and is initially stationed in his home town of Leningrad. Later he is sent to Dresden in East Germany. Putin serves in East Germany when the Soviet Union collapses. He watches with “horror” as thousands of protestors overrun the Stasi HQ’s. However, Putin defiantly protects the KGB villa. As Putin returns to Saint Petersburg (formerly Leningrad), he works for a democratic reformer named Anatoly Sobchak, and becomes Sobchak’s deputy. After Sobchak’s electoral defeat in 1996, Putin’s moves to Moscow. Eventually he is appointed by Boris Yeltsin to be head of the FSB, the Russian equivalent of the FBI and the domestic security branch of the former KGB. As Boris Yeltsin looks for a successor, he considers Putin and appoints him as prime minister as a new war in Chechnya begins. Putin becomes Yeltsin’s successor to the presidency. He doesn’t have a strong ideology when he becomes president. Myers characterizes his initial term as “buffet style” politics. However, Putin’s thinking is influenced by silovik thinking, which advocates for strong state security. The Kursk submarine disaster is the first major political setback for Putin. Putin’s disdain for the media is inflamed over this incident. Myers talks about Putin’s growing animosity with America concerning withdrawal from the ABM treaty. Putin gives a critical speech at the 2007 Munich Conference in which Putin claims “the United States, has overstepped its national borders in every way.” Myers explains that Russia thinks in terms of “spheres of influence.” Was this a warning to the West? Watching the events of the Arab Spring, Putin eventually decides to intervene to support the Assad government. A discussion of Russia’s actions in Crimea, and the blend of “hard and soft” power to include information operations, irregular forces, and cyber operations to achieve Russian military objectives. Myers explains that the war in Ukraine is currently in a “frozen conflict,” but the violence has not stopped. Myers discusses other issues to pay attention to such as events in Moldova and Georgia as well as disputed territory between Armenia and Azerbaijan, and current protests in Belarus. Dr. Phillip Karber’s “Lessons Learned” from the Russo-Ukrainian War”. Dr. Karber personally observed fighting between Ukrainian and Russian forces. He documented those observations in his lessons learned. Dr. Karber’s objective was to analyze Russian “New Generation Warfare”, assess Ukrainian military capabilities, and observe the effectiveness of Minsk I and II ceasefires. Dr. Karber and General Wesley Clark’s Report on Immediate Improvements Needed in Rapidly Implementing “Non-Lethal” U.S. Military Assistance for Defense of Ukraine. A paper called “Brothers Disunited: Russia’s Use of Military Power in Ukraine” by Roger McDermott. Another paper from the Foreign Military Studies Officer (FSMO). THINKING LIKE A RUSSIAN OFFICER: Basic Factors And Contemporary Thinking On The Nature Of War by Timothy Thomas.